That means 500 young island foxes captured during annual counting this fall will receive microchips that will identify those individual animals for the rest of their lives. 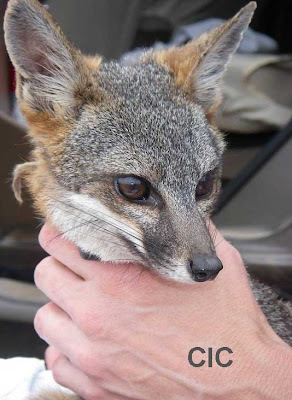 Why are microchips so important to the conservation of the endangered island fox? By scanning each microchip while the fox is still in the trap and checking the data we can limit the amount of time, or occurrences, that an animal is handled by humans by immediately releasing foxes that have already been captured that year. They [microchips] also support our ability to make sure each fox receives the necessary vaccines and in the proper doses. 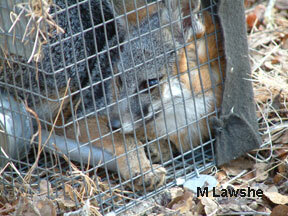 Proper identification of each fox is probably the most important aspect of our recovery and research efforts. Because individual animals can be quickly identified, we now understand that male island fox pups tend to disperse as far as possible from their parents’ territory, while females tend to stay near by. On Catalina Island there is a small isthmus between the large part of the island and a small area to the northwest. Few island foxes venture across the isthmus and it was thought they were males dispersing to find territory. However, a microchip helped researchers identify a trailblazing female that also made the journey. How does a passive identification tag or microchip work? 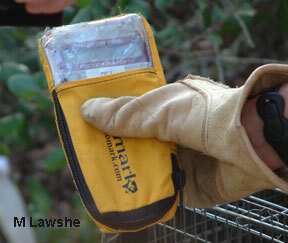 Each microchip costs $10 but the investment in island fox conservation is priceless. Help make a difference for local wildlife, including the Channel Island fox. 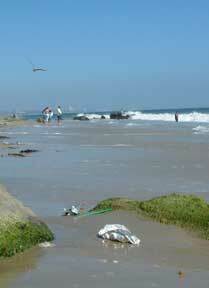 Trash in our local waterways and ocean can be life threatening to wildlife. 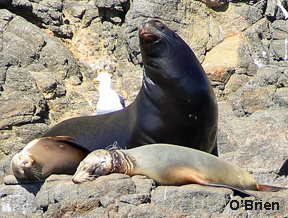 One of our friends took this photo of a female sea lion on the Channel Islands. If you look at the female laying along the bottom of the photo, you can see some kind of man-made debris wrapped around the animal’s neck and cutting into her flesh. What might seem like benign trash can be dangerous to small animals. Last year a young island fox got its head caught in a small potato chip bag. In its panic to remove the bag, the island fox ended up in the surf and drown. Some trash can even look like natural items on the beach. See items we found on the beach in June on Santa Cruz Island. Help Clean-up the Beach and keep wildlife and people safe. Volunteers can register the morning of Coastal Clean-up Day at either the Channel Island National Park Visitor Center or the east end of Spinnaker Drive (Surfer’s Knoll). This island fox was born in 2006 and captured as a juvenile her first autumn. She was only six months old when she received her first health check and an identification microchip. 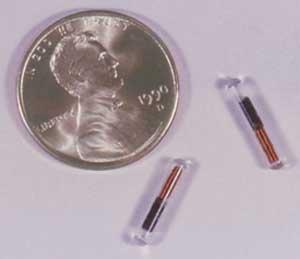 A tiny passive electronic identification tag was placed under her skin, between her shoulders. For the rest of her life, biologists would be able to identify her as an individual. 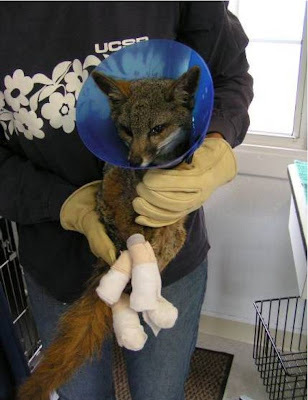 In the days immediately following the fire the fox had become dehydrated and malnourished because of her injuries. Over the course of several weeks she was nursed back to health at the Catalina Island Conservancy Foxpital. Before her release back into the wild, Burnie Boots was fitted with a radio collar funded through Friends of the Island Fox and our first Fox Ambassador School–the girls of Westridge School in Pasadena. The radio collar enabled biologists to follow the little female fox’s movements in the wild and in the fall she was recaptured and found to be fully recovered. In 2008, at age two and a half, Burnie was captured in the fall island-fox count. Her microchip identified her even though she had few physical signs of her earlier injuries. During her health check biologists recorded that she showed signs of having nursed pups. Conservation efforts had made a difference! Burnie Boots survived because of health treatment. She was tracked with a radio collar and now had successfully helped to increase the population of endangered island foxes on Catalina. Burnie Boots lived a completely wild life for the next year. When she was recaptured in the fall of 2009, she was in good health and weighed 4.6 lbs. The battery on her radio collar was low and she was doing well. The radio collar was removed. 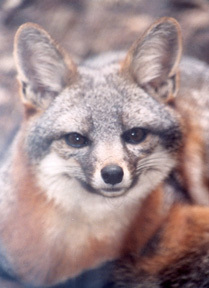 For the next three seasons, Burnie Boots avoided the fall capture, but she continued to be part of the growing island fox population on Catalina Island. At seven years of age, Burnie Boots’ individual story has come to an end. But because of her microchip we know she spent all of her life in a fairly small territory in a canyon behind the town of Avalon. Even after the fire, she stayed in that territory and raised pups in the area. Though she was an aging female, there was evidence Burnie had nursed a litter of pups this year. So while her individual story has ended, Burnie lives on in the DNA she has passed on to several litters of pups. This fall maybe her pups will receive ID microchips and start stories of their own. Microchips help biologists to better understand island fox behavior. You can play a vital role in helping to save endangered island foxes. Just $10 microchips an island fox for life. Please Donate in the upper right.